We would all agree that the flooring of the interior has a huge impact on the appeal of the space. Aside from that, it could also affect the way you access the area. With that, your choice of materials for your home’s flooring is very important. One of the most common flooring materials is wood since it looks natural and it has a thicker wear surface which can be sanded or finished many times. This is true if you use solid wood floors instead of the engineered ones. But whatever you use, the wooden appeal it gives your space is still the same. 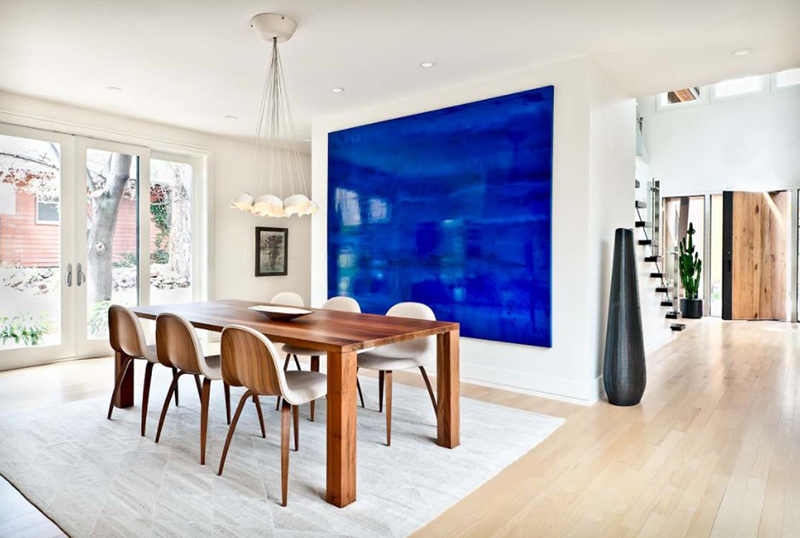 Well, today, we are going to show you a round-up of dining rooms that made use of light wood flooring. You will see that these dining areas look really great with this kind of flooring. This is a very beautiful interior! It looks really refreshing with the use of white, light wood flooring and a textured wall feature. The geometric print of the carpet adds beauty to this dining area. Love the design of the chairs and the lighting! You can also see that their wine storage is located just near the dining space. This dining space also has the kitchen and living area in it. Although the space is small, it has everything one needs in it. 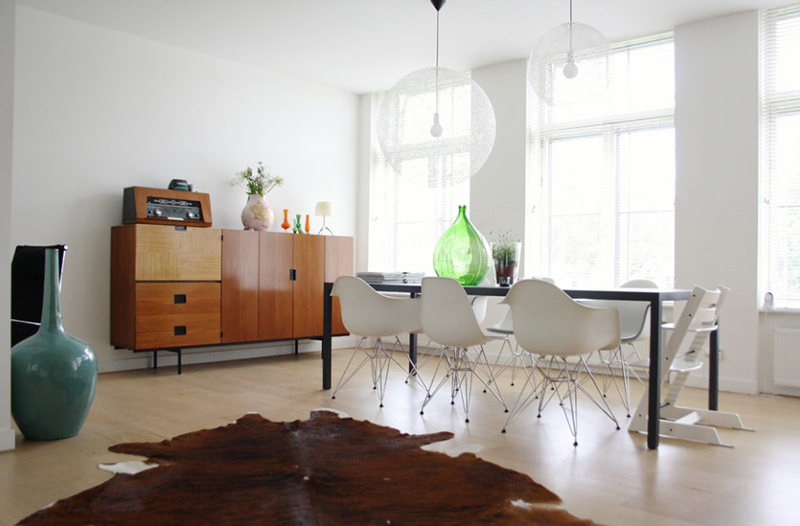 A simple modern dining area with a classic Scandinavian touch. Notice that the windows allow a good view of the outdoor space. Look at all that snow! 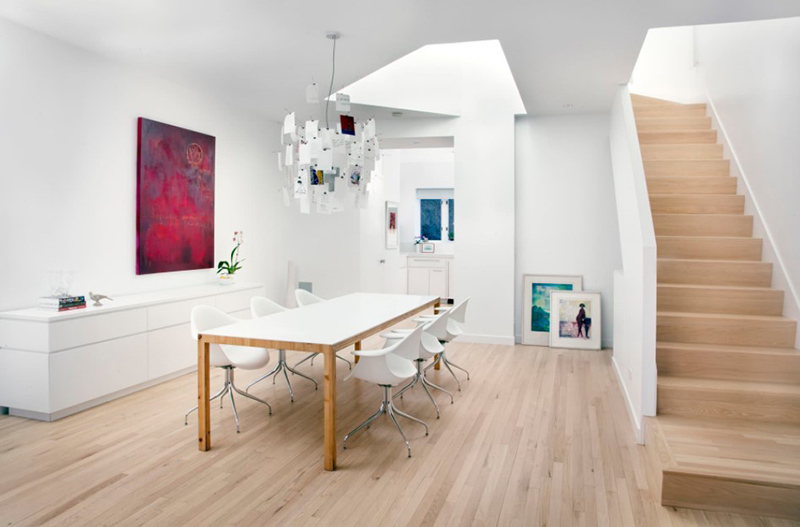 This dining room used light wood floor which is a good match with the white walls and white furniture. 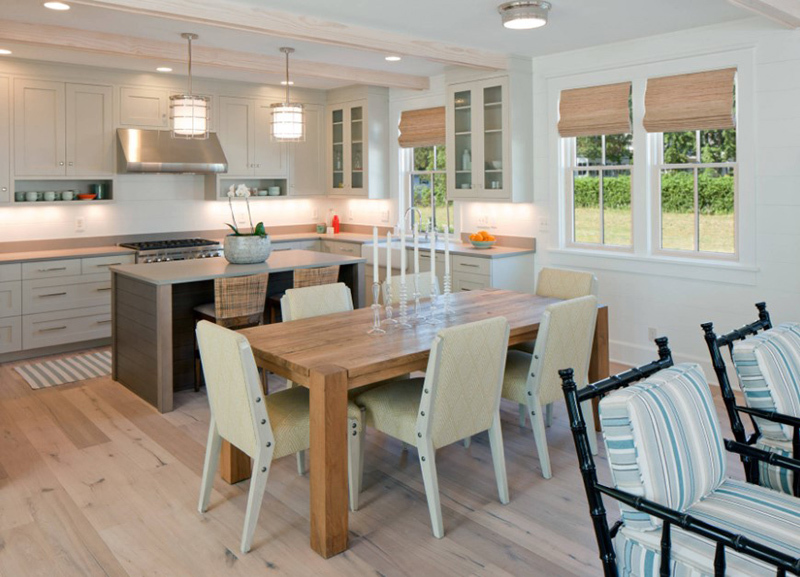 Light flooring with darker siding of the island completes the natural warm appeal of the space. 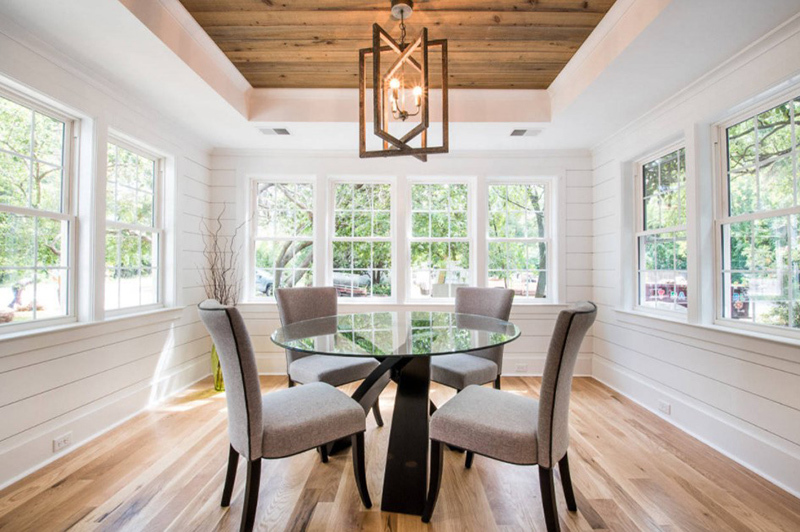 Notice the classic looking pendant lights above the dining table. Light wood meets the tight, commercial-grade Berber carpet of the living area. 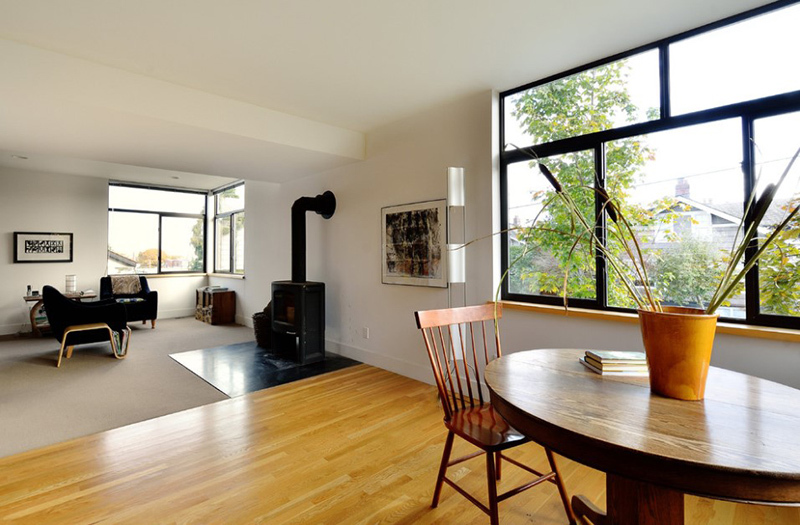 The space has a cozier feeling with the good amount of natural light in the area. Work with modern gray colors with light wood. Mixing subtly warm woods with serious grays produces a sophisticated balance that brings out the best of both. 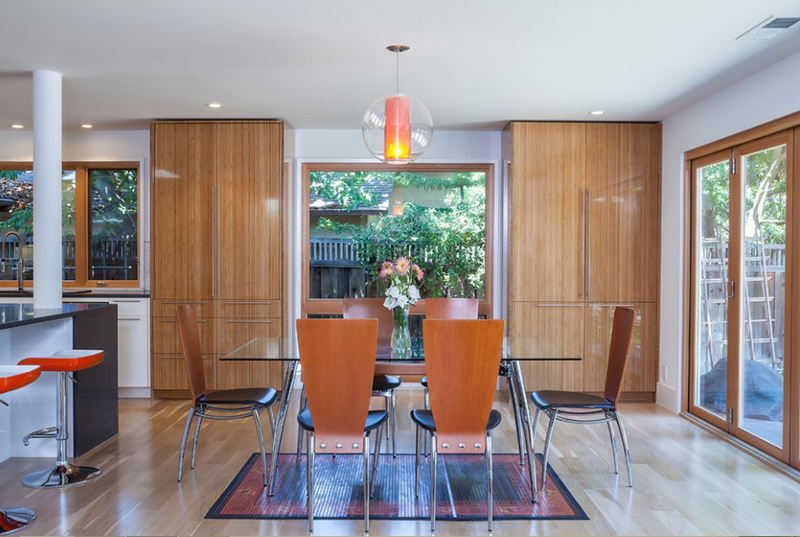 This mid-sized contemporary dining space has light wood floor and brown walls. 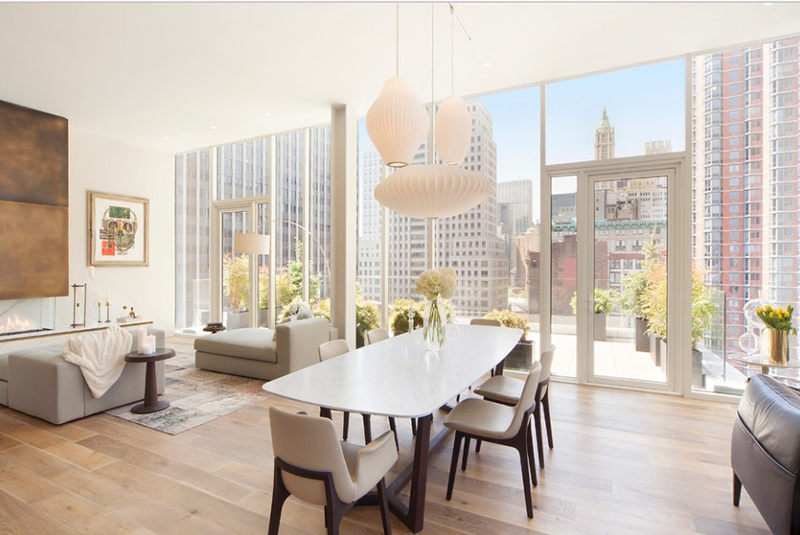 The floor-to-ceiling window allows natural light to get into the area. I love the dining chair in here! The wooden dining table in here matches with the flooring. 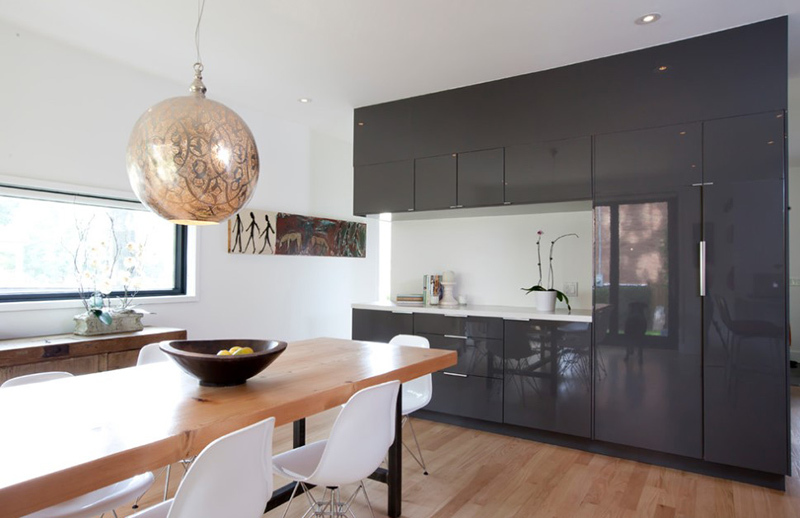 The kitchen cabinet is a good contrast to the white walls. The dining space has all white colors in it and the artworks in it look very nice too. 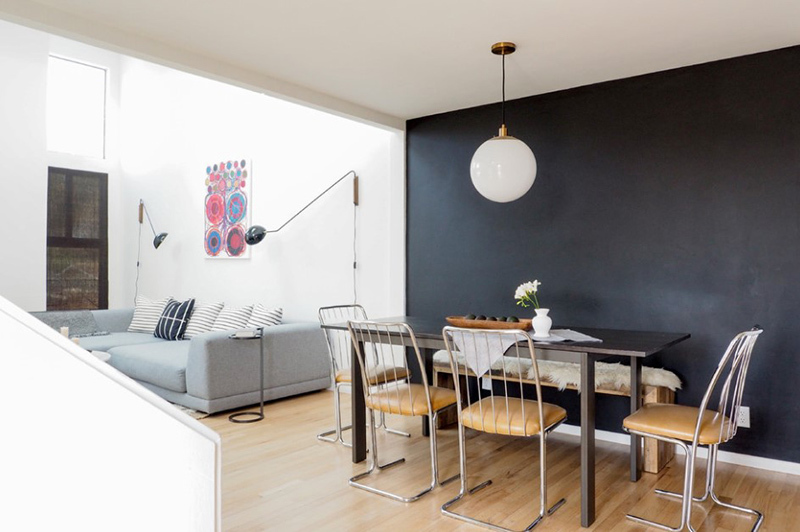 Although one side of the wall is black, it doesn’t look dull because of the light wood flooring and the white wall on the other side. The owner of this house is an art collector. In order to highlight the artworks, he made everything neutral just like what you can see here. Obviously, the art works indeed pop up! Aside from that, warm wood tones were selected to keep the house from becoming cold and sterile. 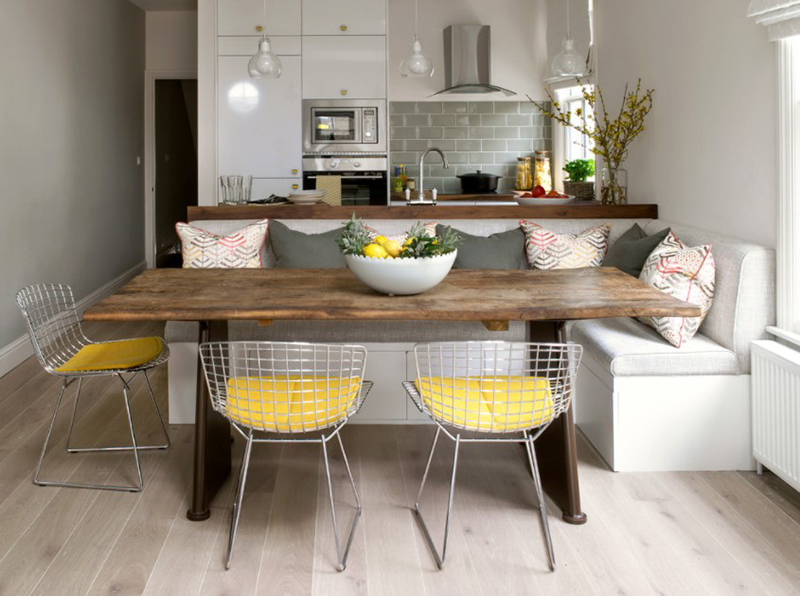 Don’t you love this bright and airy modern dining space? There are many white elements in here that made it bright and beautiful. It also used wood grain for the tile floors. Aside from the light wood floor and white walls of this dining area, the round glass dining table and the lighting added appeal to it. A light floor can tone down the formality of a dining area, giving it a casual feel like what you can see in this space. The yellow pads on the chairs added a bright contrast to the area. 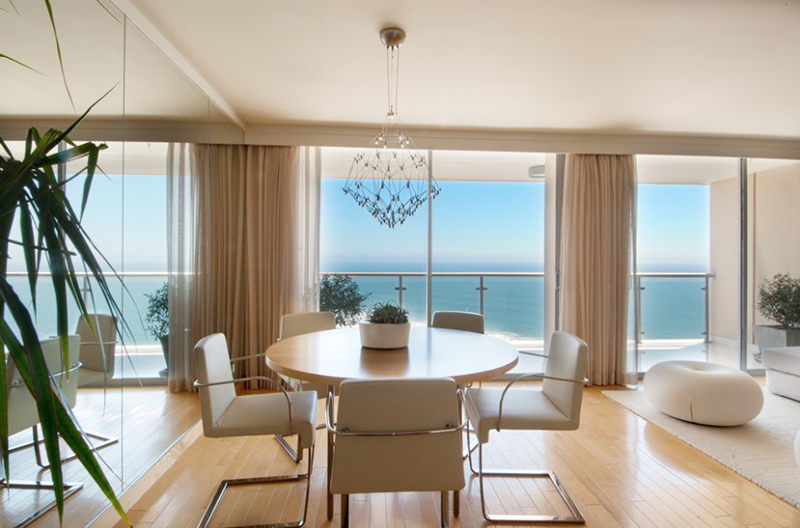 This elevated dining area has a wooden flooring that is fitted throughout. 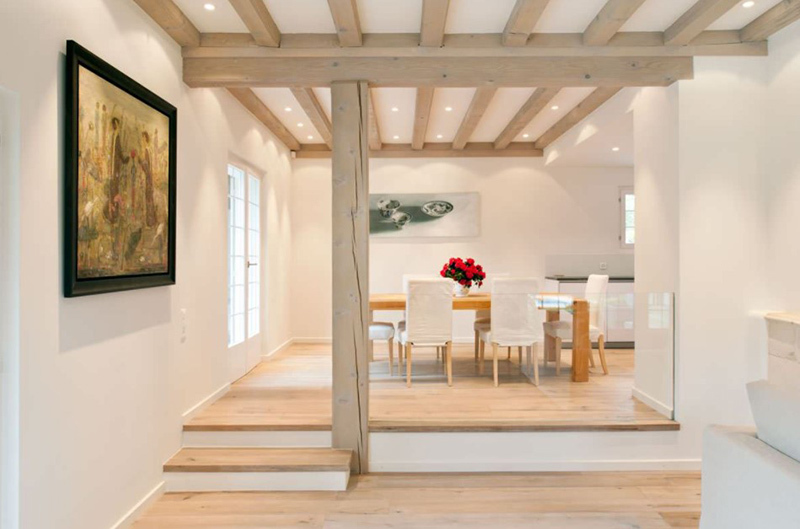 The existing wooden beams in the ceilings were painted with a white-washed look to match the floor. Lovely space indeed! A wall of mirrors virtually expands this dining area which also has floor-to-ceiling glass windows. From here, one can get a good look at the waters outside. Isn’t this a beautiful space? You can see that there are many wooden features in here but it is balanced with the use of glass in the dining table and lighting. The flooring of this house is from a local mill. It is laminated it onto a plywood backer and it has a very subtle grey stain and the topcoat is Bona Naturale. The result is very nice especially with the brick walls on the side. Although other flooring materials already gained popularity like concrete, wood still remains common and popular. That is why many homes still prefer to use them especially in areas with lesser traffic. But others also use it in public areas like the living room and dining room. The usage of wooden flooring adds a natural appeal to a space which is the reason why many homeowners still use it despite the wide variety of options available in the market. Do you use wood for your home? Let us know in the comment section below.